Filipino child favorite Steve Pestka. Eclectablog was the first to notice the unusual surge in “likes” for Pestka’s Facebook page. After three weeks of little growth, Pestka’s page suddenly grew from a steady 215 or fewer “likes” per week on May 20th, to 5,905 “likes” per week on May 28, just one week later. 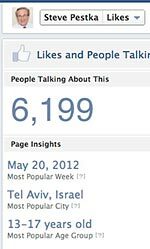 Overall, Pestka’s went from 1,000 or so likes at the end of April to 7,500 in about a month. 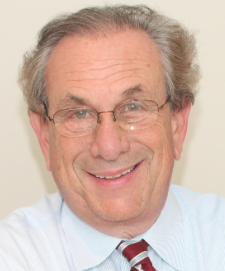 At one point, as Eclectablog notes, with proof, the preponderance of new “likes” were coming from underage children in the Philippines (now they’re coming from underage Israelis), where Pestka’s campaign would like us to believe that the AARP member is a huge hit with the under-17 demographic. Facebook data also suggests that lots of underage Filipino and Israeli children are “talking about” Steve Pestka. When asked about Pestka’s sudden surge in popularity among young Filipinos and Israelis, his campaign blamed the surge of support on Facebook ads they claim to have recently placed. Really? We’re to believe that an American congressional primary involving a 60 year old man is going to cause a sensation among 13 year old Filipino and Israeli children. That’s the story that Pestka is sticking to? 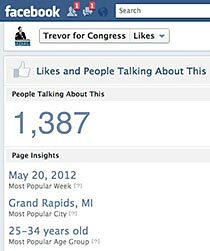 Not to mention, when you check out the Facebook page of his primary opponent, Trevor Thomas, you’ll note that Thomas’ most popular “like” demographic is 25-34 year olds in Grand Rapids, Michigan, i.e., adults in his own congressional district – which makes sense. In fact, Eclectablog uncovered a more likely explanation. There are services you can pay to create fake momentum on Facebook with a surge of paid-for “likes.” But Pestka has denied this. So if he is doing this, he lied to the voters about it. And if he isn’t doing it, then it still remains unanswered why thousands of children in the Philippines and Israel would suddenly be so enamored with an American congressional primary candidate, let alone one who could be their grandfather – not exactly the profile of the kind of person children seek out on Facebook. While Pestka’s youthful opponent is attracting the interest of adults in his own congressional district. The entire thing is kind of creepy. When I hear about the possibility of someone paying for the support of 13 year old children in developing countries, the first thing that comes to mind is illegal forced child labor – were actual children paid, or forced, to do this for Pestka? The second thing that comes to mind is the recent experience of Rep. Weiner in dealing with underage social media contacts. Did Pestka have any personal interaction with these children on Facebook or elsewhere? Did any of them contact him? Did he contact any of them? If so, what was said? And were any photos shared? At a minimum this is a creepy and sleazy dirty trick for any political candidate. Steve Pestka’s explanation to date strains credulity. He needs to explain to the voters of Michigan what is going on.